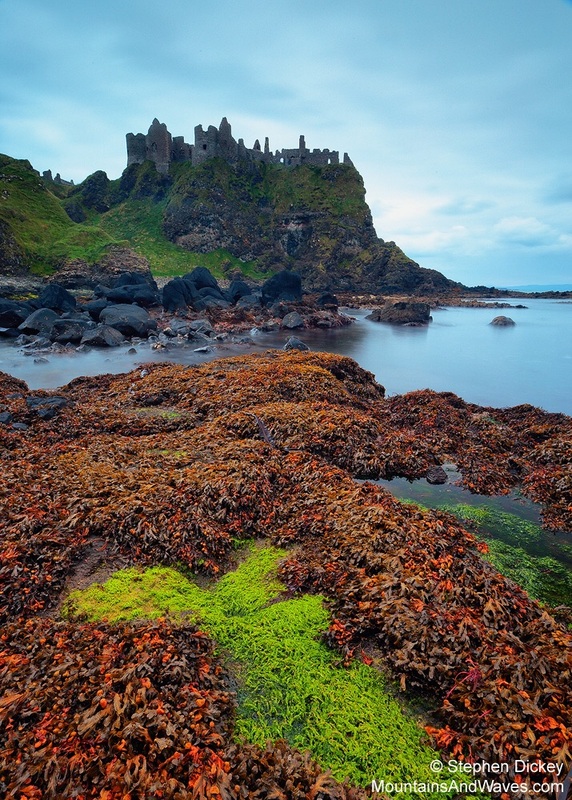 This beautiful medieval castle lies in a brilliant defensive position close to Portrush in Northern Ireland. There has been some form of castle on this site since the 13th century. I recommend reading the Dunluce Castle Wikipedia entry to learn more about its fascinating history. Landscape photographers will probably enjoy photographing the castle from the eastern side as it affords the most dramatic backdrop as well as the most handsome view of the castle itself. There are 2 superb vantage points, the first of which is shown in the landscape photograph above. Parking at the castle, head right through the fields to the cliff tops due east of the castle. The landowner has very sensible erected a fence a safe distance from the edge of the cliffs. This means an ultra-wide angle lens will be less useful than a mid-range zoom, or in the case of the landscape photograph above, a long zoom. However, as the photograph below shows, a wide angle lens works well in the right spot. Another brilliant spot landscape photographers will love is the area at sea level to the immediate east of the castle. All of the photographs below are taken from that area. The walk down to the shore is more of a scramble down a very steep slope. Sturdy walking boots are recommended as the surface is very uneven and full of holes. I recently went down here with 3 friends of varying fitness levels - we all found the climb back up to the car park to be extremely challenging, especially when carrying heavy landscape photography equipment. I would strongly recommend that persons with any sort of mobility issue do not attempt this climb. As seen in the photographs, a wide-angle lens is essential to show the castle in its setting. There are varying colours of seaweed on the rocks below the cliff-faces which make for interesting (but treacherously slippy) foreground interest. At high tide longer exposures will capture interesting movement in the water as it crashes into this rugged section of coast.